Simon Wiesenthal’s The Sunflower is a gripping text that wrestles with important, difficult questions in the wake of the Holocaust. Not only is it a true story about the experiences of the author, but it provides the framework for students to dig deeper into the concepts of forgiveness, genocide, and “grey” areas. The author himself has invited many famous, brilliant people to answer the same questions your students will focus on in this incredible Socratic Seminar. Socratic Seminar days are some of my favorite times spent in the classroom. After having them prep the class period (or two) before, I sit back and listen to their brilliance (while grading of course!). Even after teaching this course about 4 times, I still learn something new from my students every session. They think critically, ask good questions, and build on one another’s line of reasoning. It’s a beautiful thing to behold. This resource includes a few essentials for conducting excellent student-driven, inquiry-based discussions in the History classroom. Check out the details below. Teacher Directions: I explain my method of conducting The Sunflower Socratic Seminar. I also outline when to use each resource and explain my method of grading. I do not include a rubric because I have tried using them and find them arduous when I’m trying to keep up with the discussion. I’ve found a simpler, yet effective way to grade which I explain here. SS Student Directions: Before you conduct your first Socratic Seminar, your students need to know what it’s all about and what it should look like. This handout provides an overview of the purpose behind Socratic Seminars and gives your students guidelines to follow for success. This is available in PDF format only. The Sunflower SS Student Worksheet: This worksheet provides your students with an assortment of questions about pgs. 24-55 of Wiesenthal’s The Sunflower. The worksheet centers around the idea of forgiveness, whether Simon can forgive in this situation, whether the Karl’s actions are “forgivable,” what students think Simon should have done, etc. It also provides students with the opportunity to create two of their own questions to use towards the end of the Socratic Seminar. This comes in PDF & Word editable format. 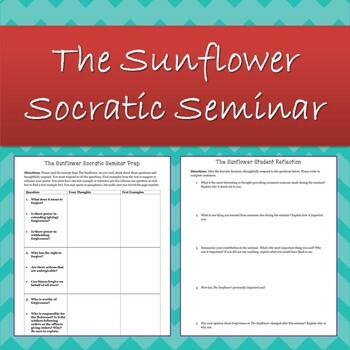 The Sunflower Student Reflection: After the Socratic Seminar, students should reflect! There are two versions of this worksheet depending on whether you conduct two session (half the class participates in each session) or you conduct one session. Each reflection worksheet contains 5-6 questions. Both versions come in PDF & Word editable format. Simon Wiesenthal’s The Sunflower text. I use pgs. 24-55 of the text, which center around Simon’s interactions with Karl (the Nazi officer).